I recently purchased a Western Digital My Passport Ultra (1TB, USB 3.0) external hard disk as I was running out of space to save my files. Although I dual-boot a GNU/Linux distribution (which is the awesome Fedora 21 nowadays) with Windows 8.1, and almost all of my friends rely on the Windows operating system, I took the decision to format it into ‘Ext4’ anyway, despite having the obvious drawback to which I am bound (that would be sharing data of course 🙂 ). To be honest, I never had used a native GNU/Linux file system on a large USB hard disk before, thus, after creating an ‘Ext4’ file system on the 1TB USB drive, I made an interesting (and irritating) observation. What happened was that, after formatting the drive into ‘Ext4’, whenever I mounted the USB disk, even when I was not using it, the LED starts to indicate (by blinking) a mild disk activity. I ignored it the first time, but every time I mounted the drive, it happened again and again. And on all these instances the LED kept blinking non-stop for minutes and the only way stop it was to detach the USB disk from the computer. So in an attempt to isolate its cause, I used the ‘iotop‘ utility (it’s a tool that sorts & lists processes by their disk I/O consumption). 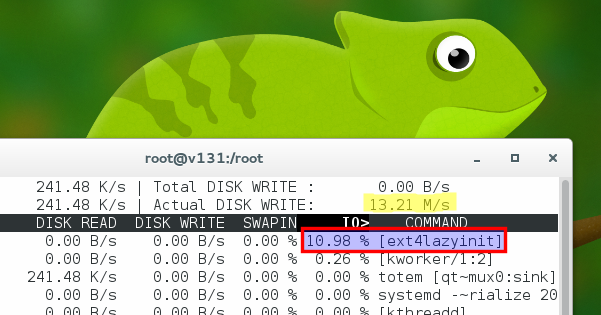 And as soon as I opened it, ‘iotop’ listed a process called ‘ext4lazyinit’ that was consuming a mild I/O bandwidth (about 11-13 Mb/s) out of my WD USB hard disk. Due to its name and since it was a newly formatted file system, I suspected that it probably had something to do with the ‘Ext4’ file system. A little Googling conformed my suspicion, it was indeed an ‘Ext4’ related process, finishing things up from the background. You see, when creating a file system in GNU/Linux, a special kind of index gets created called ‘index node’, without which a file system cannot hold data. However, creating an ‘index node’ when formatting a large partition (1 TB in this instance) could take a while and therefore can delay the formatting process. So as a fix, when formatting a drive, ‘Ext4’ creates a basic ‘index node’ only, one that is just enough to mount the file system and get things going. And as soon as the file system gets mounted, ‘Ext4’ silently creates the rest of the ‘index node’ using ‘ext4lazyinit’. By default it is supposed to write to the disk using about 16 Mb/s (though here it was between 11-14 Mb/s). For newer hard drives this is a reasonably small percentage of their total write speed (about 11% for my WD My Passport Ultra series), thus the users can carry on their tasks without significant delays. If this process gets interrupted, then it ‘Ext4’ will carry it on the next time it is mounted. This will happen on and on, until the whole ‘index node’ is created. So in theory, there is nothing to worry about. But personally, I like to keep things simple, and the sooner a job is finished, the better. And also, power failures do occur from time to time where I live, and who knows, they could corrupt the ‘index node’. Nonetheless, if you are interested, then there is a fix, though for it to work, you need to re-format the file system, and that is going to destroy the data on it (obviously). If you cannot afford that (say that you have already filled it up and don’t have anywhere else to backup the data), then the best solution is to just let ‘ext4lazyinit’ do its thing, and it will finish things up, eventually. But if you are okay with formatting the drive, then you can follow the below procedure to force ‘Ext4’ to create the whole ‘index node’ while formatting the drive (or individual partitions, mine only contains a single partition) and that will be the end of it. Note: ‘/dev/sdc1‘ is the partition path, make sure to replace it accordingly. Note: Here too replace the label ‘my_passport‘, and the partition path ‘/dev/sdc1‘, accordingly (if you have more than one partition, then re-format them all with ‘lazy_itable…’ and ‘lazy_journal…’ options set to zero). The time it takes for the ‘index node’ to be fully initialized, depends on the size and the read/write speed of your drive, but since unlike above, here ‘Ext4” will be operating at the full performance capacity of your hard drive, thus it should not take a long time to complete (my 1 TB WD My Passport Ultra USB hard drive took about two and half minutes). While all this is happening, ‘Ext4’ will give you a report of the ongoing ‘index node’ initialization process, as shown below. Once everything is finished, you can remove and reattach the USB hard disk and the newly created partition will be mounted automatically. And from now on, at idle, the LED should not indicate any ‘suspicious’ activity. Well, that’s it, good luck!. Hey nice article! I do have Western Digital Passport Ultra 1 TB, i was thinking to format it to ext4, now i changed my mind, have you tried formatting it with any other filesystem like XFS or JFS? I think there won’t be any issue like this in other filesystem. No I haven’t considered reformatting into a different file system. ‘Ext4’ is a robust file system, plus, I can convert it into ‘Btrfs’ in the future, without having to lose any data as well. But as I pointed out in the article, if the drive is still empty, then you can reformat it into ‘Ext4’ using the special arguments that I pointed out in the article, and this ‘issue’ will be fixed permanently. Done! Thanks for the info! I have formatted to ext4 with your command and the LED blink is stopped! It’s working as normal as it should. One doubt is, after unmounting or safely removing the drive in Ubuntu. The LED is still glowing, i think this is an indication of the power suppy as i checked it was not mounted, what you think? I wanted to ask you if this fix has any impact on the performance of ext4 file system on my hard drive because i don’t want to lose any advantage ext4 offers against NTFS, which has fragmentation issue! This has no performance issue whatsoever!. In fact, if there ever was one (due to the default formatting options, which was the cause of the LED blinking in the first place), now it’s fixed!. About the LED glowing: Well, I’ve only used it under Fedora 21 so far, and as soon as I safely remove it, the LED goes back to a long blinking state, which indicates now you can safely remove it from the USB port. This doesn’t happen when you unmount it, because safely removing it (which invokes cutting the power to it) and unmounting it are two different things. Ok! The reason for LED blinking before was Index Node and with your command, Index Node has completed right after formatting the drive. Am i correct? If it’s long blinking activity, then you should be fine. The ‘unmount’ option on Ubuntu could be the same as safely remove (since we’re talking about a menu option on a GUI and that menu name can mean anything), but the ‘unmount’ I was speaking was the act of unmountting a file system using the command-line. Is there a software in ubuntu which can format the hard drive without using terminal. I want to format my hard drive to ext4 bcz its fast and support otg. I successfully format my pendrive using ur above method. Now i am not able to access my pd.When ever i tried to copy anything to drive ,it says permission denied…. Please help.. When your drive get mounted, open it in your File Manager and copy its mounted location (once you’re in the mounted location, press ‘Ctrl’ + ‘l’ keys in the file manager, it’ll give you the current location). 1)I have finally formated my western digital hard drive with your above method. I used below comment for write access. 2) I noticed a very strange thing .After formatting wd hard disk it shows 50.1 gb used.how is possible.I have not copied anything in it. 3)Is there a way to read and write data in ext4 formatted hd in wiñdows 7. 1). Yes, if you want the drive to be mounted with read/write access on any ‘Linux’ computer under any user name, then yes, you’ve done the correct thing. The command I gave you is the most secure one, but it won’t be much useful under your requirements. 2). It’s not strange at all. You see, when creating a file system, the file system preserves a space for its own use (such as for the ‘inodes’ & the ‘journal’ etc. They’re necessary features of a modern file system and unfortunately they take a reasonable amount of space as well). Now I don’t remember exactly how much the ‘ext4’ file system preserved when I formatted the 1TB WD drive, and I certainly cannot re-format it now 🙂 . However, I have a 80GB drive which I use as a temporary storage unit. I re-formatted it, and then took a note of the percentage of the reserved space by the ‘ext4’ file system, and then multiplied it with actual capacity of my 1TB WB drive and it showed that the total reserved space for a drive of that size should be set around 50.0916 GB… which is roughly 50.1GB. So your readings are accurate. No need to fear. 3). There are tools that can read/write mount ‘ext4’ file systems, but I highly recommend that you mount your drive read only mode as they can easily corrupt the data if mounted with write access. That said, if you want to use the drive to be used with read/write access on Windows and ‘Linux’ then the best solution is to format it into NTFS. Bro…do u know any way by which we can connect ext4 hard drive to Android device .I format my hard disk to this format thinking Android supports ext file format by default but it didn’t. It shows damaged sd card message. Thanks man I’m seeing this ext4lazyinit on a server, and I need to use that new drive to receive data asap so I’m using your mkfs format command to create the full index inode first… and it’s just done as i’m typing this, a few mins for 1TB. Thanks again! Dear, thanks for your help. You know if you can make without losing data? Unfortunately, to ‘fix’ this issue means that you have to lose the data. There is no other way around it. Hello Gayan. Thanks for your answer. I’m trying to work with my Raspberry, hopefully prove me. Thank you very much for this good article. It’s simple, wel described and really helpful! You’re welcome Jean 🙂 . Thanks a lot. This definitively solved the ‘problem’. It ate 12 GB RAM! Man that’s crazy!, that’s probably a bug. Glad you found the article useful anyway. I’m didn’t clearly understand the question. However, even if you don’t follow the guide and do not re-format your drive, you have nothing to worry about. The creation of ‘index node’ will be carried out (until it reaches its completion) by the file system utility, automatically.